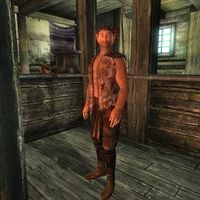 Daenlin is a Bosmer smith and proprietor of The Archer's Paradox in the southern part of Bravil. He offers repair services and sells a wide variety of archery equipment, including the unique Bow of Infliction. Like most other merchants in Cyrodiil, he lives a life of hard work and very little spare time. He sleeps on the second floor of his shop until 6am and spends two hours wandering around the ground floor until he unlocks the doors at 8am. For the next twelve hours he offers his services without any breaks until closing time at 8pm. Once the shop is locked up, he leaves and eats a two-hour dinner on the second floor of the neighboring The Lonely Suitor Lodge before returning to the shop at 10pm. At midnight, he heads upstairs and falls asleep in his bed. On Sundas, he breaks off his usual routine and, after waking up at 6am, exits the shop for his weekly hunting trip outside of Bravil. He will hunt deer for venison just outside town on the Green Road and near the stony path leading to Flooded Mine. After only two hours of hunting, he returns to his shop and his usual routines. Daenlin's wardrobe reflects his passion in life: a huntsman vest with matching pants and moccasins. In his waking hours, he is always equipped with an iron bow and nine steel arrows. He also carries an iron dagger, the shop key, and a small amount of gold. Daenlin has quite a few odd philosophies about the practice of archery and introduces himself accordingly: "The Archer's Paradox. Because a perfect arrow flies forever, and that's impossible. I'm Daenlin, and I have no perfect arrows." He will also be more than happy to share his views on Bravil's infamous Count Regulus Terentius: "I have nothing to say about the Count and his son. The rest of the town is a little rough. But I don't mind. I like it that way." Daenlin's hunting routine should last until his dinnertime at 8pm, however his package to offer services takes priority and thus his time in the woods is shortened to two hours.